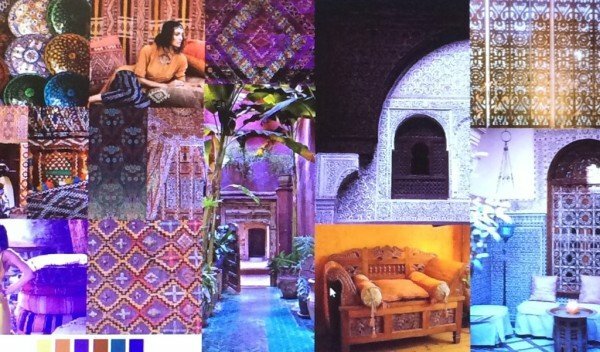 I was very fortunate to be chosen to join the auspicious company of the Stylecraft Blogstars. I know many of you will use Stylecraft’s fabulous yarn for your projects and if you pop over to their website you can see the full range of yarn celebrities who have joined this happy group. Just when we planned to have our little family escape to Barcelona, the lovely people at Stylecraft invited me to join the other bloggers for a preview weekend over in West Yorkshire. Can you imagine how I was gutted to miss meeting the other members of the gropu? There are twelve of us in all and nine of the blogstars were able to visit Stylecraft’s mill. 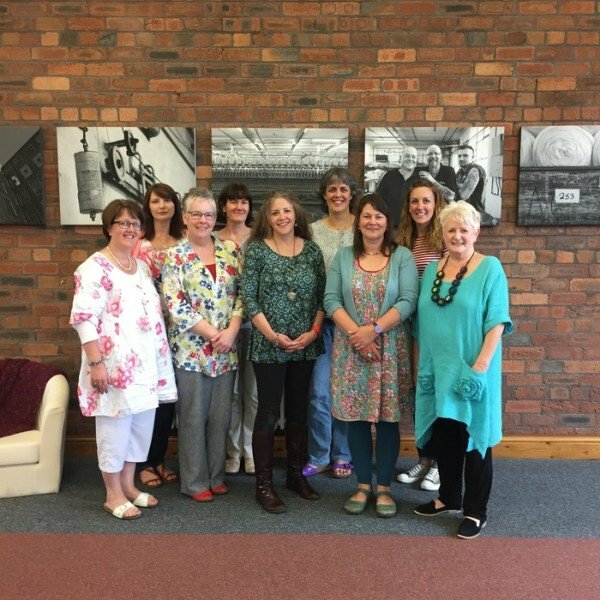 Here is a lovely picture of them: Katherine of Crafternoon Treats : Sandra of Cherry Heart : Heather of The Patchwork Heart : Julia of Hand Knitted Things : Phil of The Twisted Yarn : Helen of The Woolly Adventures of a Knitting Kitty : Lucy from Attic 24 : Sarah of Annaboo’s House : Sue of Susan Pinner Yarn Art. Like me, Jane Crowfoot and Angela of Get Knotted Yarn Craft. were not able to be there. You can also read more about each of the Blogstars here. 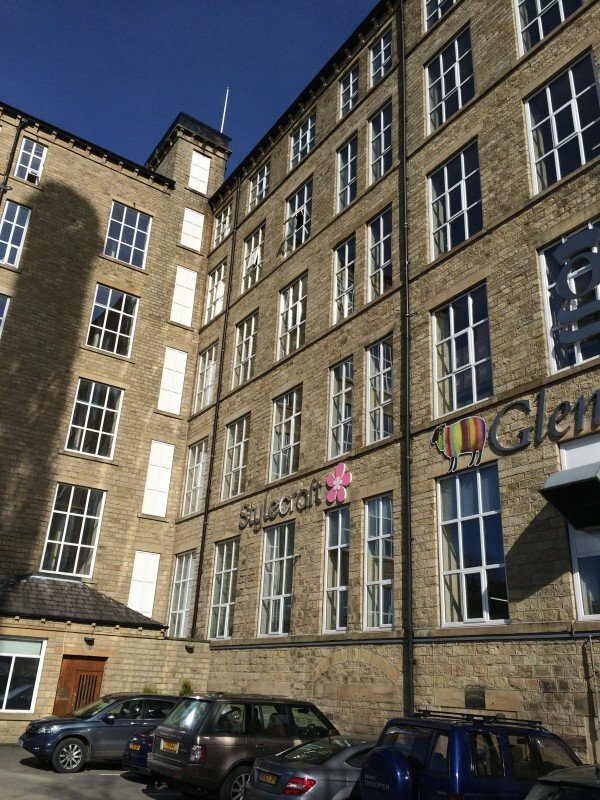 A couple of weeks later I was able to revisit the mill at Slaithwaite. It is an impressive sight. You might remember I visited once before. 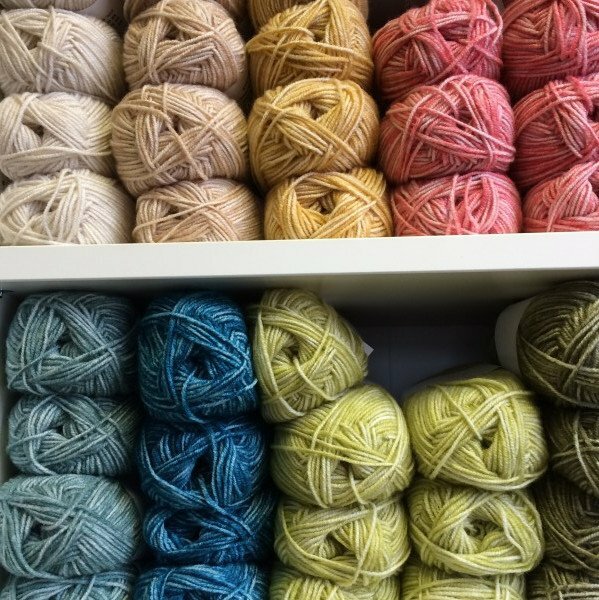 I loved seeing how the yarn was spun – so inspiring. Well I got the chance to look at what will be appearing in the shops for the Autumn Winter and learning what the inspiration was for the collection. I have long been an admirer of Amanda Crawford and it was lovely to have a personal tour of the collection with Amanda and Anna from Stylecraft. 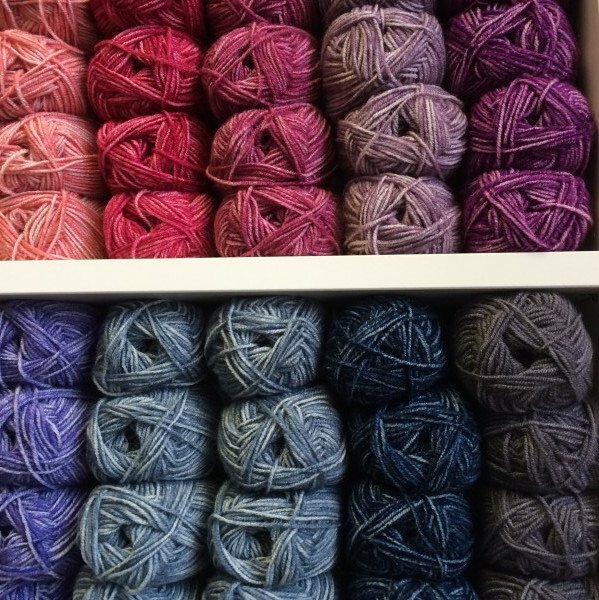 There are so many yarns and patterns to tempt you. 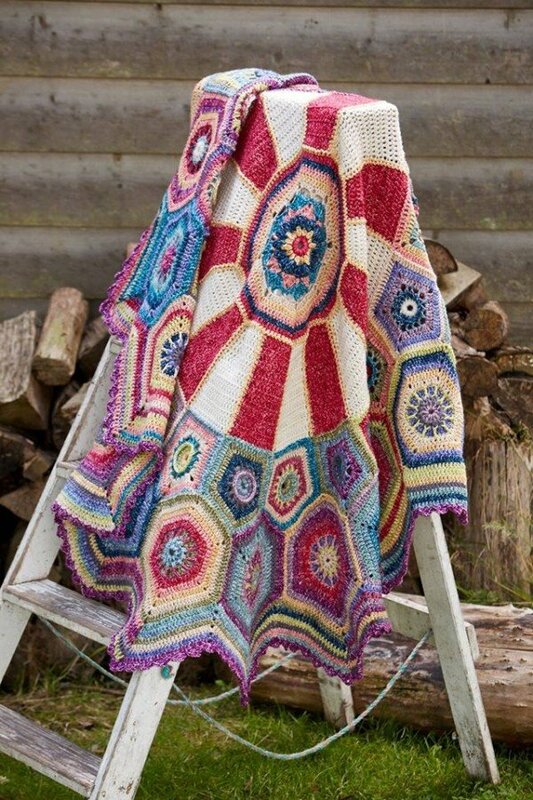 Firstly I must mention the fabulous Carousel Crochet Along by Sue Pinner. If you enjoy a crochet challenge you will love this pattern. It is stunning. I saw the lovely Batik yarn, which is going to be very, popular. I have a pattern plan for my sample Batik yarn and I will share that with you soon. I was also very taken with this poncho design in the fabulous Carnival. I have already cast on and I am enjoying a little bit of a knitting distraction. Finally the Stylecraft chunky yarn will be perfect for my quick knit gifts, presents for my closest friends at Christmas. I know this pattern and this yarn will be homemade festive combination. 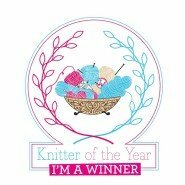 I know how fortunate I am to be included in this fabulous group of knitting and crochet bloggers. 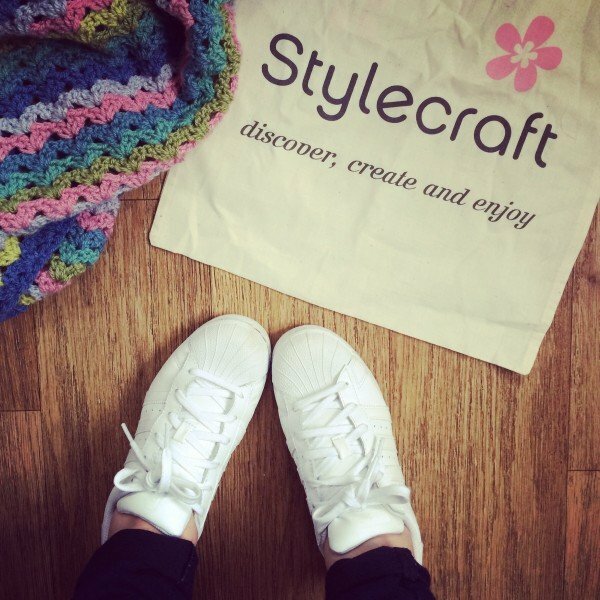 As a celebration this weekend I have another giveaway – I have two prizes to give away to readers of the blog – £10 each of vouchers for Stylecraft yarn to be redeemed in any ‘bricks-and-mortar’ yarn shop, a handy project bag and a sample ball of new Autumn/Winter 16 yarn. Leave me a comment below with your email address telling me what your favourite gift pattern is and I will choose two winners at random on Monday morning. This giveaway competition has now closed and the random generator got 3 and 14 – So congratulations to Anna and Babs. The gifts will be in the post! I like Bella Cocos coaster pattern as im a relative newby and they are quick and easy, whilst looking much more intricate. My favourite is actually your double sided circular pot stand from your How to Crochet book, one of my first ever projects and never fails to please! I have to admit that I haven’t gifted much in the way of yarny projects because most of my friends/family are not into crocheted things. However…. I have crocheted my Mum a shawl which she loved and send a dear Canadian friend a scarf and wrist warmers which she loved so I think that scarves are my favourite yarny gift! No pattern though because I make my own patterns up as I am a designer! Hope you had a great time away!! I like to gift shawlettes which can be worn in many ways. I have also gifted socks. Experience has taught me to only gift to those who love my efforts. Hi Emma! My favorite pattern to gift right now is the Quick coaster Pattern from Lulu Loves blog. I just make two sets of them for teacher gifts this year. Hope they liked them! My favourite pattern is inspired by Heather and its Circle of Friends. I usually gift the socks that I make. It’s hard to choose but my favourite go to gift pattern is fingerless mittens. 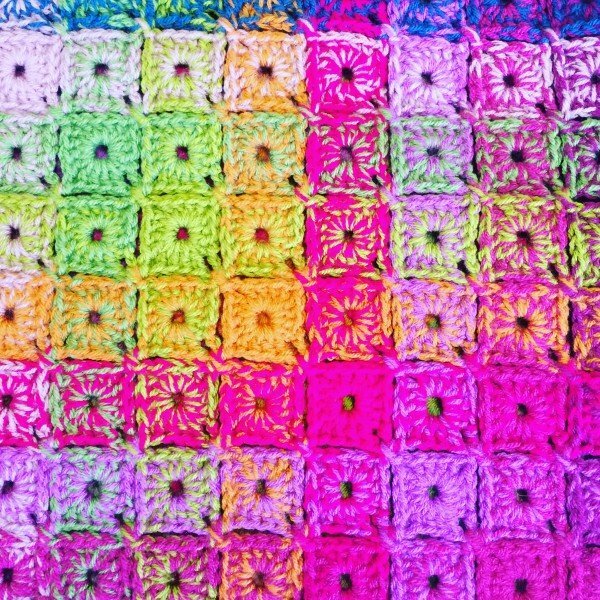 They crochet up quick in the various types of stylecraft yarn. Hi – the only crochet things I do as gifts are blankets, so they only happen on special occasions because they take a while! V envious of your mill tour. Oh I would have to say anything for a new baby, especially blankets, so useful and such fun to make. Those bright pinks! I love them! I never make the same gift twice I haven’t the patience so don’t really have a favourite pattern – I do like to make odd things for people, I knitted a traffic cone once! I like t give a mandala as a gift as they are quick enough to make and look great!!! You have a great time with picking colours at the same time. My friend recently had a baby after a long time trying, so I gifted her a unicorn that I crocheted. I have only recently learnt to crochet, so I was very pleased when it turned out well! What a great giveaway thanks 🙂 I usually gift blankets and often fall back on a trusty ripple. Always using style craft dk, I’ve just not found anything to beat it, especially as most of my gifts are baby blankets. We all know how important washabilityis with babies around. I love making gifts that are individual to that person, my 2 best ones are a cosy cowl and a cute Christmas elf. But I love blankets for babies. I have lots of favourites, it depends who it’s for! I found a lovely baby bonnet pattern via pinterest that was really lovely to make and lovely to give as a new baby gift. I always knit my friends headbands as cute gifts. In a chunky or super chunky yarn they take no time at all, and there are so many cute patterns that suit their individual personalities. 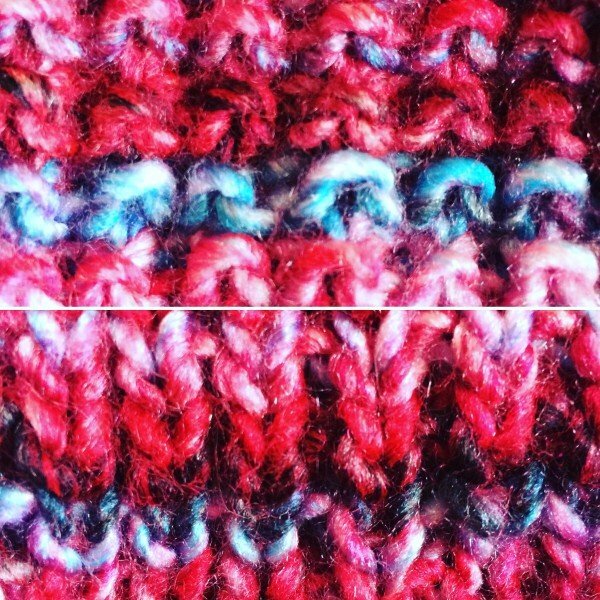 Just now I’m mad for the animal headband patterns from Sincerely Louise…I must have done about ten of them by now! I match the colours to the colour of the recipient’s cat! I love making to gift people with, and the kids teachers all got mug cosies and hot drink treats at the end of the school year but my favourite thing I’ve been making recently is shawls in a mixture of colour. It’s a simple pattern from zeens and roger that I found on Pinterest but I love it! I’m getting ready for Christmas gifting! I made Cherry Heart’s Painted Roses blanket for my Mum and she loved it so much that I adapted the pattern to make a matching cushion. I gift crochet blankets, I love thinking that my makes can bring that little bit of joy to people when they’re snuggled under them! It’s amazing to have a talent which means you can turn a few balls of wool into something useful and beautiful.